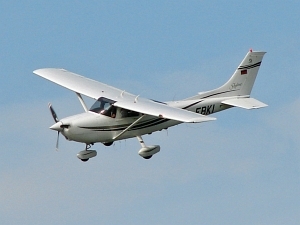 The Cessna 182 Skylane is a single engine four-seat light touring aircraft produced by the US-American manufacturer Cessna Aircraft Company, a subsidiary of Textron Aviation. Total Production: 21.864 (until 1985), still in production. Was also produced by Reims, France as F182 and by DINFIA, Argentinien as A-182. Production ended in 1985 but was resumed in 1996 with models 182S, 182T & T182T (Turbocharged). Current production model is the Skylane 182T which is powered by a 230 hp rated Lycoming IO-540-AB1A5 engine.